Lock in a great price for Marialena Rooms – rated 8.2 by recent guests! Very good location near to chora of Skopelos,nice view from our balcony,great hospitality. Centrally located to harbour and promenade. Great views. Neat studio. Comfortable beds. Clean linen. Wonderful hosts ready to respond to guest needs and most helpful. Not much. The shower could not be used without flooding the bathroom floor. The owner wanted to be paid in cash and was most unpleasant because I refused to. The room had no or poor facilities. Generally a bad experience. Great location though. This accommodation should not be part of booking.com’s inventory. It’s rating of an 8 plus is fake. We had a quaint little balcony with lovely views of the port. The room was very clean and comfortable in an excellent position to walk to the tavernas, port, beach and around the town. Everything was excellent. The location is brilliant, in the heart of nice Skopelos town. We arrived by ferry and our host Yannis met us at the port and then took us to the apartment and make sure we were comfortable before he left. He also makes excellent restaurant suggestions as well as beach suggestions. Rooms are modern and very nicely done with comfortable beds and two good bathrooms and a nice kitchen. The host was always great and very accommodating. I would definitely go back again! Very good position! near the port, near the bus stop and near the center of Skopelos town. Awesome view from the room. Kindness of the room’s proprietress. A very good place near the Center and very quiet. I recommand it. Friendly owners. It was nice that the owner welcomed us at the boat. The location was great and the little garden was nice. One of our best sellers in Skopelos Town! Marialena Rooms is in the town of Skopelos, 150 feet from the port and 2.5 miles from Staphylos Beach. Rooms are air conditioned and have direct or partial views of the sea. Bright rooms with TV and a fridge are offered at Marialena. Balconies are furnished, and a private bathroom with shower is included. Supermarkets, restaurants and a bus stop are located right outside Marialena. Free public parking is available at the port. 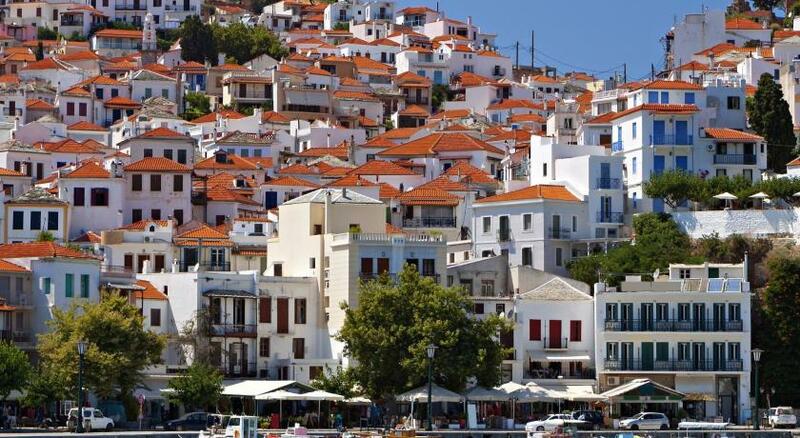 뀐 Located in the top-rated area in Skopelos Town, this property has an excellent location score of 9.4! When would you like to stay at Marialena Rooms? Opening to a furnished balcony with Aegean Sea views, this bright room comes with air conditioning, a TV and fridge. Overlooking the Aegean Sea from its furnished balcony, this bright room comes with air conditioning, a TV and fridge. House Rules Marialena Rooms takes special requests – add in the next step! Marialena Rooms accepts these cards and reserves the right to temporarily hold an amount prior to arrival. I did miss not having a kettle, mugs and drinking glasses. There’s no kitchen, although that wasn’t a problem for us. Janez the perfect host !! The interior was all a bit dated. useless shower, forgot to switch on electricity for hot water, terrible stairs to get luggage into the room (didn´t even offer to carry anything), forgot to give the wifi key. the view and location. you cannot spoil that. It is very dusty, the dust is like everywhere! The electric water heater in the kitchen was so dirty that i didn't ever dare to use it. One of the bathroom is so small. The other bathroom is big enough but very dusty. All floor is dusty. I even found a cockcroach! It is very big, with two bedrooms and two bathrooms. It also has a big family room. The location is good enough to reach the beach side.